Progesterone is a hormone primarily involved in pregnancy and the female menstrual cycle. Normally, progesterone is produced naturally by the ovaries. However, low-levels of this hormone occur in pre-menopausal and menopausal women, in addition to women suffering from infertility. In these cases, some women choose to supplement their bodies with progesterone. One of the most common and effective methods of progesterone replacement is through progesterone creams. In pre-menopausal women, hormone levels begin to become erratic and inconsistent. While estrogen levels may stay within normal levels, many women experience a dramatic reduction in progesterone levels. Due to this absence of progesterone, these women can begin to experience the early stages of hormone withdrawal found in menopausal women. These symptoms can include irritability, vaginal dryness, anxiety, hot flashes, and night sweats. Treating these symptoms is often as simple as replacing the natural progesterone lost with a supplement. Progesterone replacement is used to help bring the body’s progesterone levels back within the accepted range, and thereby alleviating these uncomfortable and painful symptoms. Progesterone creams are one of the most efficient ways to replace progesterone. The cream is simply applied to areas of the body with a high capillary count, such as breasts, chest, face, or feet. While progesterone creams are an effective course of treatment for many women, it should be noted that not all progesterone creams are the same. Many creams sacrifice quality for price, This leaves with you with a cheap, but ineffective product, and still no relief from your symptoms. 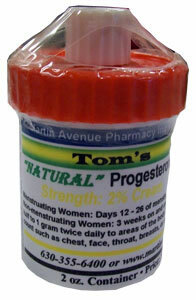 Tom’s Natural Progesterone 2% Cream at Martin Avenue Pharmacy is formulated with the opposite philosophy in mind. Only the highest quality progesterone is used and the utmost care is taken to ensure the quality of our product. Tom’s Natural Progesterone 2% Cream uses a special transdermal formulation to allow the hormone to be more easily absorbed by your body. Our cream comes in a red top jar and dispensed by pressing from the bottom rather than removing the lid, thereby avoiding the risk of oxidation. Tom’s Natural Progesterone 2% Cream is also formulated with the most efficient potency level. Various progesterone creams use different potency levels with formulations as low as 1.6% to as high as 3%. Lower potency creams are inefficient and may not provide the desired effect. Likewise, higher potency creams such as a 3% cream contain too much progesterone than is needed. Pre-menopausal and menopausal symptoms are already and uncomfortable and frustrating burden. When it comes to your health and wellness, avoid the cheap imitations and knock-offs. Invest in only the best progesterone creams on the market. Get the symptom relief you deserve with Tom’s Natural Progesterone 2% Cream at Martin Avenue Pharmacy.